Grantmakers Concerned with Immigrants and Refugees (GCIR) and Hispanics in Philanthropy (HIP) have created this issue brief to update funders on this crisis, which will worsen with the arrival of the much-publicized exodus of Central American asylum seekers and migrants, including many families with young children. This brief covers the multi-faceted nature of the situation, its impact on communities on both sides of the border, and how funders can support local efforts to address urgent humanitarian needs and long-term policy and systemic challenges. It draws on information shared during our November 8th joint telephonic briefing and interviews with local organizations leading the response. In late October, U.S. Immigration and Custom Enforcement (ICE) ended “Safe Release,” a program that helped families that had requested asylum at the U.S.-México border to contact family members and plan where to go upon release. Within 24 hours of announcing this decision, ICE began dropping families that had applied for asylum at the San Diego Greyhound station—leaving many stranded with little to no money in their pockets or plans for how to get to their next destination. According to ICE officials, the reason for this shift is to free detention space for the arrival of the much-publicized exodus of Central American asylum seekers and migrants, including many families with young children. Yet with 60 to 80 unprepared individuals being released each day, and with ICE expected to soon begin releasing between 150 and 200 people daily, this new policy has exacerbated an already growing humanitarian crisis. 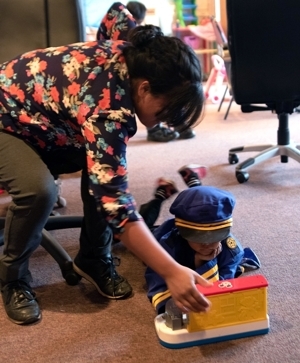 The San Diego Rapid Response Network (SDRRN), which launched a shelter two-and-a-half weeks ago to house the first group of released families, recently moved that shelter for the third time to accommodate the growing numbers. 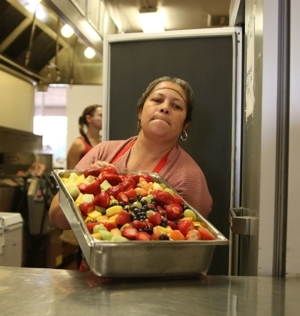 The current site, already nearing capacity, sleeps about 120 individuals and feeds up to 250 people a day. Many arrive very sick, with children often suffering from flu symptoms, upper respiratory infections, scabies, or lice. Organizers say most families are from Central America. Most typically spend only two or three nights at the shelter, and 90 percent are headed to other destinations in the United States to reunite with family and loved ones. SDRRN is made up of more than two-dozen social service groups, many with extensive experience in service provision, but members do not have experience operating shelters. Ongoing challenges include arranging transportation for families, coordinating meals for hundreds of people per day, keeping the shelter clean and orderly, and providing urgent medical care. Given the pace of arrivals and the expected two- to three-fold increase, SDRRN is concerned that, as funds for travel expenses run low, fewer families will be able to leave, and the shelter will run out of beds. The consequences of this could be severe: if families end up in the streets, they could be picked up and charged for loitering or trespassing, which would impede their chances at asylum and increase their chances of deportation—and possible separation from loved ones. This crisis is exacerbated by with the presence of approximately 7,000 troops—5,200 who have recently arrived—in military bases along the border. The deployment also spurred the arrival of the “Minutemen”—a group of armed vigilantes with reported ties to white nationalists that self-organizes patrols along the border. State officials and groups in San Diego are concerned about the potential for tensions to spark confrontations or even violence. In the face of these challenges, local organizations, networks, and funders have been working together at full capacity to respond to the emerging needs of families being released by ICE. Some national and state-based immigrant groups, faith-based institutions, and other social justice organizations are preparing to come to the border to assist with operations, provide support for asylum seekers, and to counter the efforts of anti-immigrant vigilantes. The involvement of these diverse stakeholders from the local, state, and national levels not only bolsters this response but also creates an opportunity for movement building and increasing the region’s capacity for the future. In response to this growing humanitarian crisis, organizations in San Diego need immediate resources to address the urgent needs facing asylum-seeking families. They also need support over the longer term to reframe the narrative on this exodus to reflect the voices and humanity of those affected. And they need to build the capacity of their individual organizations and the broader movement to craft a powerful, comprehensive, and locally led strategy to address long-term needs in the San Diego-Tijuana border region. Travel and communication expenses for families able to reunite with family or friends, including bus fare, meal support, phone cards, etc. Temporary shelter for migrant families opens in San Diego, organizers ask for help, The San Diego Union-Tribune, November 19, 2018. San Diego Rapid Response Network Offers To House People Seeking Asylum, Help With Legal Fees, KPBS, November 19, 2018. Photos taken at the temporary shelter run by San Diego Rapid Response Network. All photos courtesy of network partner Jewish Family Service of San Diego.